Sharon Robinson shares memories of her famous father in this warm loving biography of the man who broke the color barrier in baseball. Jackie Robinson was an outstanding athlete, a devoted family man and a dedicated civil rights activist. The author explores the fascinating circumstances surrounding Jackie Robinson's breakthrough. She also tells the off-the-field story of Robinson's hard-won victories and the inspiring effect he had on his family, his community. . . his country! Includes never-before-published letters by Jackie Robinson, as well as photos from the Robinson family archives. Sharon Robinson, daughter of baseball legend Jackie Robinson, is the author of several works of fiction and nonfiction. She has also written several widely praised nonfiction books about her father, including JACKIE'S NINE: BECOMING YOUR BEST SELF and PROMISES TO KEEP: HOW JACKIE ROBINSON CHANGED AMERICA. Gr 4-7 -In captivating words and pictures, Robinson chronicles the life of her legendary father. She weaves historical events into the story of one of baseball's greatest players, revealing how they shaped his life. Her text, combined with numerous black-and-white archival and family photographs, reproductions of newspaper headlines, magazine pages, and letters, illustrates Jackie Robinson's journey from childhood to the moment that he integrated major league baseball to his life as a businessman and civil rights spokesperson. In addition to personal details, this intimate biographical sketch and authentic glimpse into the life of a great African American provides information on the post-Civil War world, race relations, and the struggle for civil rights. It will inspire readers and enhance character-education units. Pair this first purchase with the author's Jackie's Nine: Jackie Robinson's Values to Live By (Scholastic, 2001).-Tracy Bell, Durham Public Schools, NC Copyright 2004 Reed Business Information. 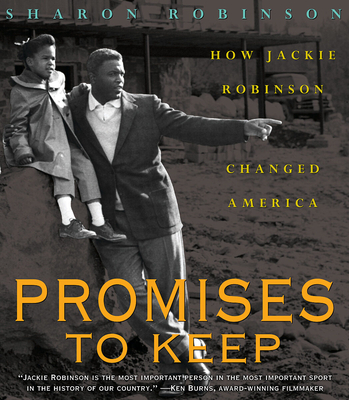 In this photo biography, Robinson (Jackie's Nine: Jackie Robinson's Values to Live By) offers an affectionate profile of her father who, she writes, "taught me to flip pancakes, hit a baseball, question political leaders, solve problems, and keep promises." The author's concise history of race relations in the United States enables youngsters to understand the underpinnings of the "segregated world" into which Robinson was born and the racism and injustices he encountered throughout his private and professional life. Especially intriguing is the author's incisive explanation of why her father was selected in 1947 as the individual to "pioneer the integration of Major League Baseball"; her discussion provides insight into the man's abilities and determination on and off the field. The volume's abundance of family photographs and reproductions of Robinson's letters to his wife and children amplify the highly personal nature of the narrative. The author notes that her parents encouraged her and her brothers to "measure our lives by the impact we had on other people's lives." Here she clearly, often eloquently, gauges the enormous impact Jackie Robinson had on so many lives as father, husband, athlete and crusader for justice and equality. Ages 9-12. (Feb.) Copyright 2004 Reed Business Information.